WASHINGTON (AP) — The fight for the House majority is over. At least that's the sense from a growing number of Democrats who are increasingly confident in their quest to seize control of at least one chamber of Congress six weeks before Election Day. The surging optimism among Democrats, usually shared in private, has begun to spill into the open as President Donald Trump's approval ratings sink and the Republican Party struggles under the weight of the president's self-imposed political crises and erratic behavior. "I do believe Democrats will win back the House of Representatives," said New Mexico Rep. Ben Ray Lujan, chairman of the Democratic Congressional Campaign Committee. "Our candidates are in a strong position." Democratic confidence is particularly strong among campaign operatives who work closely with women, a critical voting bloc that has turned away from Trump's GOP in the suburban and exurban districts where the House majority will be won or lost this fall. Polls suggest women are turbocharged and eager to punish Trump's party as the voting season begins. "I have all intentions of this institution delivering the U.S. House back for the Democrats," said Stephanie Schriock, president of EMILY'S List, an organization that supports female Democrats. "We have the candidates in place to do that and then some." But with the shock of Trump's 2016 victory still fresh, some Democrats are painfully aware that significant factors could emerge in the 45 days before the election that could derail their presumptive success. They're contending with massive spending by GOP super PACs, competing in gerrymandered congressional districts and are increasingly worried about some key candidates. That's leaving some top Democrats warning their party of the dangers of overconfidence. "This is no time for confidence. This is no time for braggadociousness or bluster," New Jersey Sen. Cory Booker told The Associated Press in a recent interview. Booker, a potential 2020 Democratic presidential contender, reminded his party of Hillary Clinton's stunning loss in the last presidential contest: "If there's any complacency, if there's any resting on their laurels, we need to go back to how people felt in the early days of November 2016." That's a tough message to push at a time when even Republican campaign professionals publicly and privately acknowledge that conventional metrics for predicting election outcomes favor Democrats. At this point in President Barack Obama's first term, Gallup reported the Democrat's approval rating at least five points higher than Trump's current 38 percent approval. Obama's party would go on to lose 63 House seats in 2010. On top of Trump's low approval, Republicans this year have also been saddled by more than 40 House retirements, ceding the power of incumbency in several competitive races. And there are continued signs that the Democratic base is far more energized in the early years of the Trump era than the GOP. "I would never tell a politician to be confident because of how the world changes," said Republican strategist Rick Tyler. "But by applying those metrics, Democrats should pick up 80 seats." "We're confident," Brazile said. "Not overconfident, but confident that we can run the tables in the Senate." Money could complicate Democrats' plans. Schriock said EMILY'S List expects to spend $37 million to influence the election, outpacing its investment in the last presidential contest. On the other side, the Congressional Leadership Fund, a super PAC allied with House Speaker Paul Ryan, expects to spend roughly $100 million. In Minnesota, which began early voting on Friday , Ryan's super PAC is dumping $8 million into an advertising campaign targeting two congressional districts. They include the 8th district, where 32-year-old former Democratic state Rep. Joe Radinovich faced charges that "he's spent his life running from the law" in a recent ad that cites multiple traffic violations. Radinovich's campaign called the claims "egregious" and "disgraceful," saying it falsely portrayed unpaid parking tickets as crimes and misrepresents a marijuana-related citation that the Democrat received as a teen. Democrats are struggling for traction in a series of contests that should be prime pickup opportunities — on paper, at least. Polling suggests several vulnerable Republicans in swing districts are performing better than expected, a list that includes Reps. Carlos Curbelo of Florida, Will Hurd of Texas, and John Katko of New York. And in Florida's 27th district, a heavily Hispanic open seat in Miami, former Health and Human Services Secretary Donna Shalala is locked in a surprisingly close contest with Republican Maria Elvira Salazar, a well-known Hispanic television reporter. 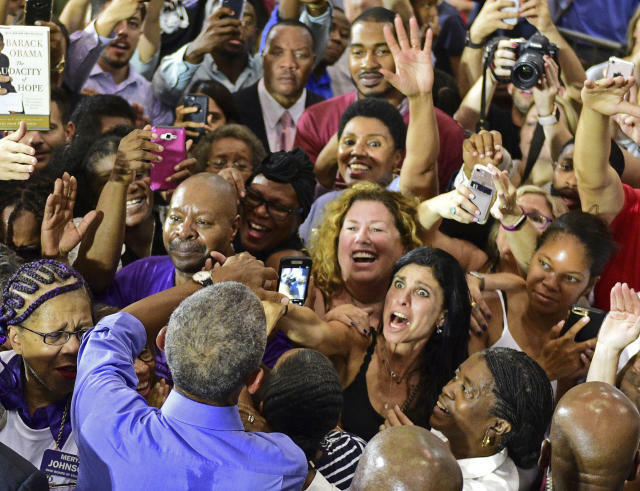 But don't relay those concerns to the people who lined up for hours outside Philadelphia's Dell Music Center on Friday to see Obama rally Democratic voters in a pivotal swing state. Della Jamison, a 65-year-old Democrat from North Philadelphia, was exuberant about her party's chances when asked. In Pennsylvania alone, Democrats envision flipping a half dozen House seats. "We are on the battlefield, baby," Jamison said. "It's already done."